Hand Therapy Services began treating patients in 1993 when Martha Meier left hospital therapy and struck out on her own. Martha grew the hand therapy practice by focusing on her patient’s care and recovery. That tradition continues today and is the focus of Hand Therapy Services Inc.
Claire Wood purchased the assets of Martha’s business in 2013 to allow Martha to pursue personal interest. The practice continues with the original belief; “if you look after your patients and give them your best care, the business will prosper”. Claire earned her BSc./OT at the University of Cape Town in South Africa. She came to the United States in 1993 with a promise of a job at Siskin Rehab Hospital in Chattanooga, TN. She joined Siskin just after arriving in the US and so began her career in Occupational Therapy and eventually Hand Therapy. After several years with Siskin, Claire moved to Atlanta, GA with her family and worked in staff & management positions with North Fulton Regional Hospital and as a Contractor for several other major hospitals including St. Josephs and Northside Forsyth. As her husband’s career moved the family from the Atlanta area, Claire worked in multiple locations including Dallas, TX, United Kingdom, and Kansas City, MO. She continued her education in Occupational Therapy & Hand Therapy during the moves and achieved her Hand Therapy Certification (CHT) after she completed the required 4000 hours practical experience and passed the board exam in 2011. 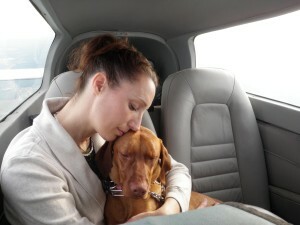 Claire with foster dog “BELLA” en-route to meet her forever family. Claire joined Martha at Hand Therapy Services in 2006, working alongside Martha to learn the proper care & treatment plans for Hand Therapy patients. Along the way, her husband’s career took the family to Kansas City against Claire’s better judgment. After suffering through several brutal winters in Kansas City, Claire convinced her husband to move back to the North Georgia area and she rejoined Martha at Hand Therapy Services. Claire has always loved the North GA area and was pleased to be able to return to the beauty of the mountains and the friendly people of the region. She practices at both the Cartersville and Jasper locations. Claire now resides in the mountains with her husband Ed & beloved dog, Bronson, a 6-year-old French Mastiff. Claire plays tennis, enjoys hiking, cooking, volunteers as a foster home for 2 animal rescues and accompanies her husband on Angel Flight missions. Claire also loves spending time with her stepchildren and grandchildren. Martha Meier received her B.S. in occupational therapy from the University of Wisconsin – Milwaukee in 1979, graduating with distinction and honors. Her professional career began at Emory Center for Rehabilitation Medicine in 1980. After several years at Emory, Martha joined Rachel Grodin, a well known hand therapist in the Atlanta area, and was mentored by Rachel to gain the practical experience required to achieve the status of Certified Hand Therapist (CHT). 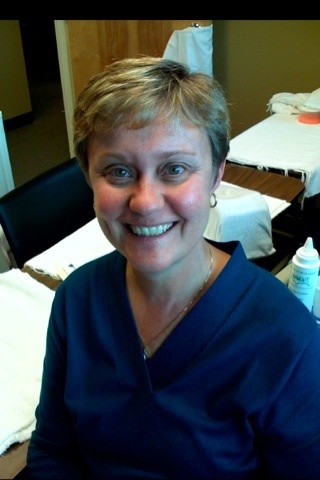 In 1990, Martha founded Hand Therapy Services in Cartersville, GA. Martha obtained her CHT certification in 1991, the first year the certification was offered. The practice thrived and Martha’s success was recognized and sought out by the owners of Jasper Physical Therapy (JPT). Martha formed a contractual relationship with JPT and added Claire Wood to the team to help cover the increasing patient load between the two clinics. In 200, JPT was bought by Atlanta Falcons Physical Therapy and the new management was keen to maintain the relationship with Hand Therapy Services and the relationship continues today. After many years of owning the practice, Martha sold the business to Claire wood in June 2013, with the goal of taking time to pursue personal interests. Martha continues to carry a patient load after selling the practice to Claire in June 2013 and mentors & coaches Claire in patient and practice matters. If you’re a past patient or current patient, we thank your for your trust and continued support. If you’re a prospective patient, welcome and give us a call to discuss your needs.